Bosque Brewing is a local brewery named for the cottonwood forest that borders the Rio Grande in Albuquerque. The design of their taproom is inspired by the experience of sitting under a cottonwood on the banks of the Rio Grande enjoying a beer! An abstracted steel tree spreads its branches over the tree-trunk-shaped bar area. Suspended from the steel branches are mobiles pf paper cottonwood leaves that move with the air circulating through the space. Spot lights concealed in the green canopy soffit above the bar project the shadows of the moving leaves onto the wall behind the bar. 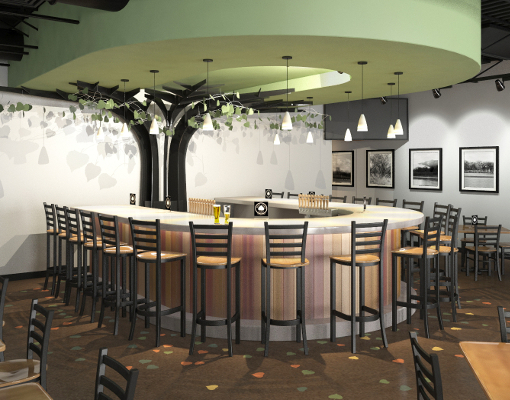 The top of the bar is made of cast-in-place concrete with flat steel cottonwood leaves embedded into the concrete. The floor around the bar is decorated with cottonwood leaf stencils to further emulate the experience of being in the bosque.